Bum bum ba bum bum. Bum bum ba bum bum. It’s usually followed by another piece you are sure to recognize: The Olympic Fanfare and Theme by none other than my favorite composer, John Williams (who recently turned 82! Happy Birthday!). This piece was commissioned for the 1984 Summer Games in Los Angeles. Its iconic brass fanfare has always been synonymous with the Olympics for my generation. I’ve heard snippets of both these pieces being played as intro/outros this year as I’ve been watching the first few days of the Sochi games. 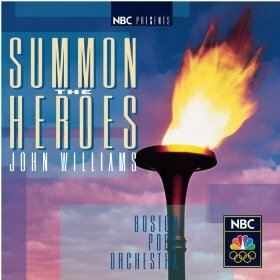 NBC is also using another John Williams piece: Summon the Heroes, written for the 1996 Atlanta games. It’s a beautiful piece; I find it even more emotionally compelling than the Fanfare. You can buy some great recordings of these pieces by the Boston Pops, with John Williams conducting (Summon the Heroes). I personally own the Greatest Hits collection, which I cannot recommend enough. The NBC “bumpers” aren’t the only place the music of John Williams will pop up during these Winter Olympics: the amazing 15-year-old Russian skater Yulia Lipnitskaya is using selections from Schindler’s List for her free skate. Lipnitskaya is always very understated with her emotions, which lends itself to this program: a small girl in a red coat, at times intense, plaintive, and childlike–I found it very moving. Look for her to make waves in the ladies competition. Figure skaters frequently choose movie themes for their program music. Another skater who used John Williams’ music was Tonya Harding in 1994; her skate to Jurassic Park at the Lillehammer Olympics remains to this day one of the strangest I have ever seen: boot problems, a false start, a botched triple axel. It only added to the strange drama surrounding her at the time. But I distinctly remember loving the music, despite not knowing who wrote it, or even having seen Jurassic Park at the time. Previous Article Why did they let Ralph Lauren design the Olympic uniforms again?